The joy of playing independent games is that you never know what you’ll find. Maybe it will be a stinker, as was Charles Ward’s last effort, Blood & Fortune. Then again, maybe it will be his current experiment, Haze Islands. Hopefully the latter, because Haze Islands is rad. Here’s the elevator pitch. You’re a pirate — yeah, I thought that might get your attention, everyone loves pirates — leading a life of daring on the green, green seas. Most of the time, this boils down to completing adventures, which might require some combination of raiding or sending your crew to occupy islands, though there’s the usual dash of exploration and preying on opposing ships. Oh, and there’s a ghost ship trawling these waters. Watch out for that. 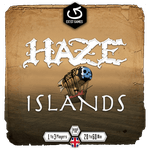 While its pitch might sound like any number of piratical outings, what makes Haze Islands so fantastic is anything but skin deep. Just to take our current example, the completing of adventurous adventures, the basic idea isn’t necessarily going to blow anyone’s hair back. When you get right down to it, these are pretty much just fancy fetch-quests. 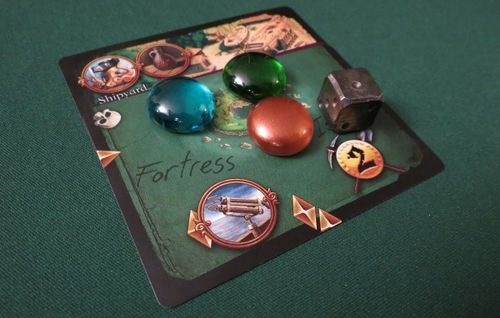 Ships have been going on fetch-quests since before board games were a thing. Here’s a history fact for you: the undertaking of fetch-quests may have been the reason boats were invented in the first place. I know! Amazing. But here’s where things get interesting. Sure, much of your task is simply to collect icons and cash them in at specific locations, and sure, you could just raid a bunch to try and find them. But raiding means drawing a bunch of cards and keeping just one, so that’s a crapshoot. Any self-respecting pirate captain is going to want to hedge their bets. So instead, you might drop off your crew at islands where you know precisely what you’re getting. A harpoon launcher here, some octopus-warriors there, maybe a whiff of hurricane magic. The danger is that your crew also act as your ship’s defenses. Send too many of your boys to shore and you’ll be a floating duck, ripe pickings for enemy captains or that scary ghost ship. And be warned, it is scary. If you end the round too close at hand, it will merrily hound and attack you, with very little you can do to stop it. That’s why they call it The Doom. Two of my favorite games are Greenland and Neanderthal, which often feel like two different scenarios for the same game. What sets them apart is their willingness to shake up their formula halfway through a session, whether by converting your polytheistic settlers to Christianity or evolving your proto-humans from wanderer to tribal status. It’s the sort of thing that only happens every so often, not even in every play session. But when it does, it’s a major moment. Just like that, your scoring, your means of interacting with other players, even the actions that are available to you are altered. You’re playing a different game than the one you were playing one turn ago even though you’re using the same rules. Haze Islands pulls something similar when it comes to rival captains or The Doom sinking your ship. Rather than getting knocked out of the game, or suffering the far less imaginative fate of having your progress reset, your goals are changed. Now you’re a castaway, floating around the isles and cobbling together a big enough crew to hijack somebody else’s ship. Or if it was The Doom who got to you, now you’re a ghost ship in thrall to their demonic demands, hounding other ships to fulfill your devil’s bargain and get you reinstated into the land of the living. And because both castaway and ghost ships are exempt from victory, everything becomes a race back to the status quo. It isn’t uncommon for surviving ships to avoid these fallen captains like a cargo of plague-riddled rats. If it wasn’t already apparent, there’s a lot going on in Haze Islands. This is one of those games that tries to do a huge amount with very little, which is why your cards are often assigned double or even triple duty. For instance, many of your actions are limited by your pool of map cards. When you want to raid a port, sail to new waters, or do, well, pretty much anything, you’ll need to discard a few of these to make it happen. 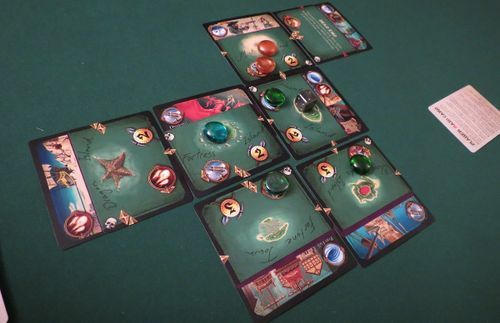 However, rather than winding up in your average discard pile, anything you get rid of will be passed to the next player’s map deck, providing them with a greater cushion for their own actions. This bestows a unique tempo to a game that’s already as swollen with considerations as a rice-bearing ship with a ruptured hull. Spending a few cards to move is more than simply moving, it’s also a way of empowering the captain next to you. And when you lack cards, you might be forced to spend a couple turns passing, giving a more frugal player the opportunity to beat you to fulfilling a particular adventure. Of course, all these interlocking systems come at a price, and your first session or two will likely suffer from some growing pains. Hunting down the right symbols without leaving yourself vulnerable to opportunistic poachers or winding up too near The Doom isn’t always an easy balance to strike. 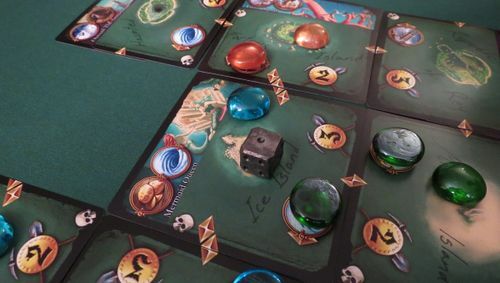 Add in a ghost ship or castaway dogging your stern, some cursed cards, and the game’s deeply clever but not terribly intuitive combat system, and you’ve got a game that’s many times more varied and intriguing than its slim deck of cards would lead anyone to believe, albeit one that also demands a bit of an investment in time and attention to figure out. Speaking only for myself, that’s hardly any price at all, especially when the game is currently being offered as a free print-and-play for one to three players. 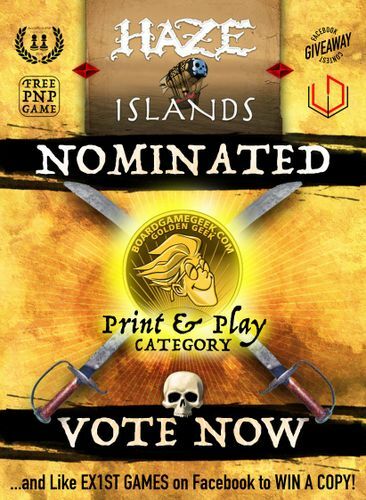 When it comes to independently designed titles, Haze Islands is one of the good ones. Yes, we have been nominated! You guys are amazing!